All wakestyle is freestyle but not all freestyle is wakestyle. This is a video I’ve been meaning to do for a long while now, but I’ve put Versus on hold the last few months. It’s a common question I hear and there are a few opinions floating around on the topic. Kiteboarding borrows from a lot of sports! There are plenty of crossovers, from surfing and wakeboarding to snowboarding. And of course there is the unique big air aspect of our sport. It’s one of the most versatile sports out there. It’s all-season, all-terrain... it's whatever you make of it. You don’t need perfect waves, an expensive boat, or mountains to get the full experience. All you need is some wind, and that's something found almost anywhere, anytime. So what is the difference between wakestyle and freestyle? These things can mean different things depending on who you ask. There are kiteboarding organizations and they have their classifications. There are articles online and everyone seems to have their own opinion. For anyone who's been kiteboarding for a while, we can agree that you know the difference when you see it. I'm not speaking for everyone, but I’ll give you my definition of wakestyle, freestyle and freeride. In our video I mentioned that I would include a video log from our trip to Florida linking up with one of our team riders Steve Lee. Stand by: that vlog will release 02/06/19. Here's the thing. Kiteboarding borrows from so many established boardsports- sports like snowboarding that have long since laid the foundation, culture and terms. In their formative years, these original sports were new, rebellious and innovating. Kiteboarding is a creative hybrid sport that borrows from many of them. The funny thing is, us kiteboarders have a tendency to try to rename ideas or tricks, often ones invented by inspiring figures from what should be considered our heritage. For this video, I'm going to pay some respect to the sports that shaped board sport culture and our sport, such as snowboarding and wakeboarding. Many may not agree with me, and that's okay. Versus is an open forum. Feel free to explain your definition of these categories in the video comment section. All wakestyle is freestyle, but not all freestyle is wakestyle. Here's what I mean.Wakestyle is borrowing from wakeboarding, so it goes without saying. It’s any trick that originated from wake or cableboarding. More or less, it's any wakeboarding trick done unhooked, with the kite low at or below 10 or 2 o’ clock, and usually powered up wearing wakeboarding boots. Now, this crosses over to freestyle, but we’ll touch on that more in a moment. Wakestyle also encompass features such as kickers, rails, or even natural obstacles like logs or riding across the sand on the beach. When features are involved, sometimes people refer to this as parkstyle. A perfect example of wakestyle is the Kite Park League. This crew is the embodiment of wakestyle in kiteboarding. They focus on features like kicker tricks or hitting rails. Most of the unhooked air tricks can be be brought over and applied to the kicker. Like one would find at the cable park, or behind the boat, they incorporate air tricks, albeit, this crosses over to freestyle. If you're looking to fill your social feed with more wakestyle kiteboarders, there are plenty of stylish riders out there like Brandon Scheid, Christophe Tack, Colleen Carol, Lucas Arsenault or James Boulding. If you're looking to cross-train, cableboarding is the perfect crossover. Although, it’s funny; usually if you can do a trick at the cable it crosses back to the kite but not the other way around. Air-tricks at the cable are more difficult and doing them with a kite is almost like having training wheels. I mean this in a good way. With the kite you can learn a trick with a bit less power and impact. At the cable, you're going into air-tricks with some power and the landing can be brutal. Heads up- many all-around kites and freestyle kites work perfectly for wakestyle. In fact, many of the riders in the Kite Park League are using freestyle crossover kites or even C-kites. My point is, you can use any kite for wakestyle riding. For this category, I'm going to include kites that offer freestyle traits, yet are in a category of their own. The main qualities you can expect from these kites are consistency, good feedback from the kite, a more moderate turning speed, and a better low-end wind range than freestyle kites. These are also more user-friendly than their freestyle counterparts. That means you can focus on the trick or the feature rather than the kite. The NV V9 is built with wakestyle in mind. It's similar to many freestyle kites in regards to design and unhooked performance. It's more controlled and it has great bar pressure and feedback. Brandon Scheid has been working on this kite with Liquid Force the last couple of years. With the P1 freeride kite being added to the catalogue, the 2019 NV is made specifically for wakestyle riders. The new 2019 RPM is another kite that has many freestyle characteristics.The bar pressure, the feedback, and the design all around makes it a great candidate for wakestyle. Like the NV, it's similar to some freestyle kites, yet it performs with the consistency and ease one would expect from a freeride kite. The consistent feel of this kite and performance would work well on sliders, kickers or unhooked. Okay, I know this is more of an all-around kite and I'll include it into that category as well. After years of testing kites, I'm still of the camp that nothing can touch the Switchblade. This is the least explosive of the kites on the wakestyle list. It also has a stronger forward pull and less slack. It will, however, pull much like a cable system off kickers and rails. When I'm using a Switchblade to unhook, I often size down to the 11m. At 163, it's the perfect size and I can really have fun unhooking in gusty conditions. This is the most consistent in regards to response, feel and bar pressure of the kites listed in the wakestyle category. You do need to use a little more strength when unhooking on a Switchblade and you want to land more downwind. All that said, I still find this kite to feel the most like the cable park. These boards are made specifically for wakestyle-minded riders. They have more rocker and are more durable. They also tend to be more playful on the water and are not as fast as other boards. Some of them can be heavier, but not all of them. They will work well on the kite and can be used to cross-train at the cable park. Heads up- they will be faster than your average cable board. Thanks to the rocker profile, they have softer landings as well. These are often the choice boards for riders who want to hit features or kiteboarders who wear boots and incorporate powered wakestyle tricks into their riding. The Echo is one of the smoothest-feeling boards I've used. It's deceptively fast for the rocker line and I've always enjoyed riding it powered up. The CBL was my choice board for a couple of years. Something about the construction and feel has always felt right on the water. I've used it at the cable park, and while it works, I do prefer a true cableboard. The Refraction is really close to the Slingshot Whip cableboard. We've used this one behind the boat, behind the kite and at the cable park. Of all the wakestyle kiteboards we've tried, this is by far the best for all three sports. The Gambler is the choice board of Craig Cunningham and Colleen Carrol. If you've ever seen these two ride, it should give you an idea of the style intended for this board. Duotone has made excellent boards for a long time and this is a wakestyle favorite for many high level riders. I rode the Stomp last season. At first I was hesitant because it was heavy and had a lot of rocker. That said, I actually like it a great deal and purchased one myself as a backup board. I don't have any logical reasons for loving this board beyond the fact that I started pushing myself harder on the water right about the time I started riding it. A tip here is that you should always size up on these boards. For example, if you would normally ride a 139, opt for a 142. Many wakestyle riders will also pair these boards with smaller fins. This will make the boards more playful and give you some room for error when landing blind. If you want to hit features, you'll want to go completely finless. Use surf wax to fill in the holes so you don't get sprayed! This will make riding upwind, jumping, and popping more difficult at first. It will, however, build your skills and make you a better, more efficient kiteboarder overall. When you do go back to fins, you'll be popping harder and jumping higher. So what about freestyle? Here's where there is a lot of confusion. Freestyle can mean a lot of things. I often speak to new kite kiteboarders who consider doing their first jumps or riding toe-side to be freestyle. Tricks like that fit more in the freeride category that we'll touch more on in a moment. The most universally agreed upon definition would apply to competitive riders. This is where certain organizational definitions come into play.These are the guys you see competing and spinning like mad, high level kiteboarders who often take a basic trick like a Blind Judge Three and turn it into a Blind Judge Seven. They also combine basic tricks into very complicated combinations. You see this style with riders like Aaron Hadlow, Yuri Zoon, or Carlos Mario. These guys are doing a lot of air tricks borrowed from wakeboarding. Yet, rather than a simple, stylish trick, they are taking it to a very high, very technical level. Kites are sometimes higher and riders will often wear boots or footstraps. So in summary, the most basic way to define freestyle would be unhooked tricks. Albeit, this is interchangeable with wakestyle. Freestyle riders tend to go bigger and focus more on how many rotations they can do rather than grabs or body position. Wakestyle riders are more focused on their style. Hence all wakestyle is freestyle, but not all freestyle is wakestyle. 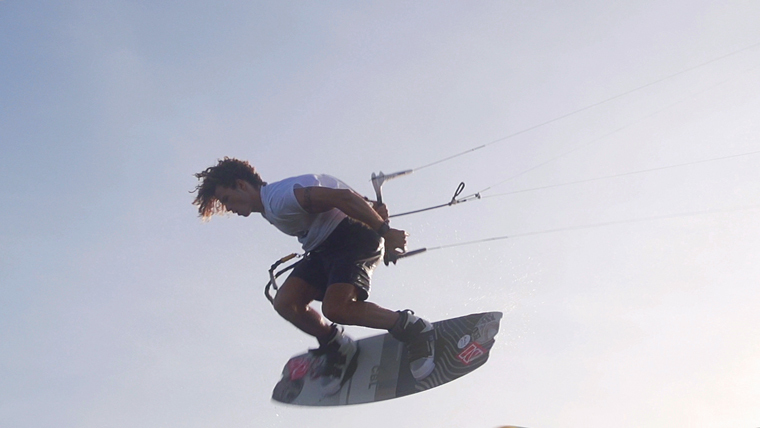 As I said, many of the competitive wakestyle riders are using freestyle kites. These kites will work well for both. I'm including these into the freestyle category as they are designed specifically for freestyle kiteboarding, meaning they have a more explosive pop and slack. In contrast, they don't offer the same low-end wind range as the kites in my wakestyle list. Either way you gravitate, both categories will work for both styles. I've done loads of content on these kite now. These are exceptional kites for anyone looking to progress into wakestyle or freestyle. They make unhooking easier and they are fun to fly. Take note: unlike our wakestyle recommendations, they do require a slightly more advanced rider. The 2018 RPM is a touch more user-friendly than the other three, yet not as user-friendly as its 2019 counterpart. Freestyle kiteboards often share a few characteristics. They have a flat rocker profile and are fast. They also tend to be stiff and have a track-like feel on the water. They will not turn on a dime like a wakestyle board. They can be less forgiving on the landings. That said, these will rock upwind more efficiently, they will load and pop better, and they tend to feel explosive. They also work great in light winds. If you pair these boards with a freestyle kite, your riding will be explosive and you will be amazed at the performance increase. Many of these boards are built with carbon for extra pop. If that is the case, you will want to ride them with footstraps as the pressure from wearing boots might tear out the inserts. If the board is made of wood, chances are you can ride them with boots. The Jaime and the Jaime Textreme might be our favorite freestyle board. It's fast, powerful, and not too hard on the knees! You can go fast and send it with this board. It handles chop well for how freestyle-minded it is. Remember, you can't use boots with the Textreme, but it is amazing for freestyle and big air. If you want to be a competitive freestyle kiteboarder, this is the board you want to ride from Duotone's lineup. Pure performance and nothing held back. This board is locked in, track-like and more effective than the Jaime. It's less playful and makes no sacrifice for performance. I've been using this board for the 2019 season and it's been my light wind secret weapon. I often size down on my kite to make up for the pure efficacy of this board. The Xcaliber is an iconic freestyle board. It's not as locked-in feeling as the other freestyle boards but it does deliver the performance any up-and-coming freestyle rider would demand. If you want a more playful yet effective freestyle board, this is a great choice. The Asylum is a step closer to a wakestyle board than the other freestyle boards on this list. It's still quite fast and effective. Slingshot has been building wakeboards long before kiteboarding even existed. That said, the quality and design is unmatched. Damp, powerful and balanced are the only words that come to mind when describing this board. If you want something that fits right between wakestyle and freestyle, the Asylum should be your choice board. The Monarch is a firecracker. Like all the freestyle boards, it's fast and explosive yet many new riders gravitate towards it. A word of warning: do not pair this board with boots. It's not designed for the impact. This is a true footstrap freestyle board. The Carbon Drive is a solid choice. It's based off the classic Liquid Force Drive board often found in our packages. The Classic Drive fits more into the freeride category. The Carbon version crosses over as the most economic carbon board on the market. So what is freeride? Freeride often gets ignored as it doesn't seem as cool as the other styles of kiteboarding. Some think of it as cruising around mowing the lawn. Others think this is old-school hooked-in kiteboarding. The thing is, the actual definition is someone who implements all the styles. It's practicing the sport without rules, regulations or parameters. It's all-around kiteboarding. In snowboarding, these are the guys who do backcountry. It makes sense that it doesn't have as much notoriety. A jack-of-all-trades might not be a master of any, but this is the category most kiteboarders fit into, and I’d bet about 75% of regular kiteboarders aspire to this, yet define it as freestyle or big air. Freeride kiteboarding encompasses everything. It's wakestyle, it's freestyle, it's fun, creative sent jumps. It can be hooked-in back rolls or front rolls with a grab. It can be jumping mangroves or riding in the waves. Its all-around kiteboarding. This is the style Blake Olsen and I focus on with our trick-tip series Ride with Blake. Not because we don't like unhooked freestyle or unhooked wakestyle. It's because we like to practice everything kiteboarding has to offer. Kiteboarding has been around for a while, but our sport is still developing. The culture is still evolving as the years go by. Right now, there are many camps within the sport promoting various disciplines, lifestyles, and practices. With all that said, these concepts are malleable. I speak to riders all the time who consider sent jumps to be freestyle. Just like the sports that came before us, the identity of our sport is evolving and will change with time. Remember, all that matters is what kiteboarding means to you. Don't let anyone decide for you. After all, it's whatever you make of it. Most importantly, kiteboarding is fun! These kites are easy to use. They have a giant wind range, and they are designed for all disciplines. These are made for all-around kiteboarding. That means if you want to ride wakestyle, freestyle, big air, or waves, these kites will work. You might sacrifice a little performance in certain categories. For example, none of these will drift as well as a wave kite. They don't offer slack like a freestyle kite. All that said, they are perfect for wakestyle or big air. They also perform well enough in all the disciplines for 90% of kiteboarders. Unless you're a pro rider getting paid to compete in a very specific discipline, you won't outgrow the capabilities of these kites. Freeride kiteboards tend to sit right in the middle. Honestly, most kiteboarders will never outgrow their capabilities. Best of all, they are often less pricey than their performance counterparts. They often have mild rocker lines, mild flex, and as you would imagine, they sit right in the middle on everything. These are great boards to learn on and especially great if you don't want to focus on any one style of the sport. They jump well enough, they have soft landings, and they are playful yet controlled. That is to say, they will not feel locked in like a freestyle board and they will not be as loose as a wakestyle board. Choose one of these if you just can't make up your mind. As always, Versus is an open forum. I'd love to hear your definition. Leave a comment on our YouTube video and let us know how you define these disciplines of our sport. If you have questions about gear, don't hesitate to reach out and ask. We're stoked to help you find the right gear. Use our live chat or just give us a call anytime.